Noting that the Indian automation industry is growing at an annual rate of 20 to 25 percent, Samir Gandhi, CEO, Gandhi Automation Pvt. Ltd, in an exclusive interview to SME Times said that with the country's gradual integration with the world economy, automation will play an important role in bringing down the costs and help increase productivity efficiency. How big is the Indian automation industry? With many players in this sector, what makes GAPL unique? Samir Gandhi: The Indian automation industry is growing at an annual rate of 20 to 25 percent. With India's gradual integration with the world economy, automation will play an important role in bringing down the costs. Besides costs, automation will also help increase productivity efficiency, aesthetics and delivery systems. Several international players are considering India as a development hub for automation products. We at Gandhi Automation's always trying to bring new concept of entrance automation to India for each segment. Gandhi Automation's core strength has been its product innovation, latest technology supported by R&D facilities of all parent companies based at Italy & Germany. Also we make sure that our products are at par with European standards, with zero untoward effects. We ensure that before the actual operation at client's premises, all our products undergoes a vigorous inspection, generally in line with European standards, which makes GAPL unique. Despite the fact that India's industrial landscape is opening up with new possibilities and prospects in the automation sector, the sector faces serious challenges in integrating new technologies and improving services to make the most out of the growing market. What are the plans of GAPL in this financial year (2008-09) in terms of expansion and exploring new markets - both domestic and global? 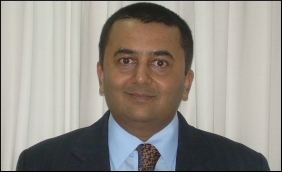 Samir Gandhi: At present, the market is around Rs. 200 crore for both industrial and commercial sector entrance automation. I however, expect it to increase exponentially; at least 50% growth every passing year. Due to globalisation and economic liberalization, consumers demand facilities existent in the first world countries. Once they are convinced about our systems, they buy them for their residential areas. Amongst industrial sector a lot of multinationals companies like Nokia are setting up their plants and they want to follow same standards worldwide. Therefore demand for such systems is set to increase. India's domestic consumption is huge and with several factors including rupee appreciation and global recession making exports less profitable, will GAPL concentrate only on the domestic markets in the future? Samir Gandhi: Appreciation of rupee against the dollar, is a major cause for worry for the RBI and exporters. Usually it used to be the other way, but of late, the rupee has been getting stronger and the dollar has been weakening. The rupee appreciation affects the export-oriented companies. A stronger rupee eventually means that Indian goods and services will be less competitive in the main export markets. But as we import our products we are benefitted by the rupee appreciation, as we have to pay lesser dollars than before to import our products. What measures according to you needs to taken to see that India is recognised as a prominent player in the automation sector? Samir Gandhi: Market for Entrance Automation is around 200 crore. But the potential is of Rs. 20,000 crore. These systems are a must for every industry reasons, main being safety & increased productivity. The only way to compete in the global market is through quality & price. These systems aid in achieving higher level of productivity. We are doing our best in educating people in the benefits of these systems. I feel the Government should give incentives for installing such systems, create norms for automation in industry & warehousing. The Entrance Automation industry is relatively new in India. How do GAPL educate its consumers about the necessity of its products? Samir Gandhi: Today many people are aware of only the concept and they do not know the working, the benefits, the safety and the savings associated with entrance automations. As the knowledge about it increases and the consumer will be educated enough, they will start to think of it as a primary requirement and treat them not as a luxury. I think five years down the line, this product will sell on facts & benefits rather than on marketing skills. On our part, we are constantly trying to educate the consumer by taking part in industrial exhibitions, doing road shows & seminars, conducting lectures, sending newsletters, etc. India's biggest weakness lies in automation industry's inability to manage financial discipline. The domestic automation industry is known for poor financial rations in terms of working capital and margins, in spite of the fact that the industry employs some of the brightest people and deals with extremely complex technology. Do you agree? Why/ Why not? Samir Gandhi: I feel that financial discipline should be given a proper focus by the industry. Automation technologies are very broad in terms of definitions and technologies considered. However, India currently stands way behind China, in terms of market size. The difference in the size clearly shows that India, despite the potential will take some time to catch-up with China, if at all. What according to you needs to be done to see that India emerge as a key global player? Samir Gandhi: If India were to grow faster than China it must increase its attractiveness to investing companies in terms of its market size and potential for luxury products. Indian consumers are more frugal and rational in spending. Chinese consumers are much more willing to pay for branded and luxury goods. There is need to increase the awareness among the SME segment, which is claimed to be a big market for the automation industry. Which are the main countries where you export your products? What is the growth ratio of your company's exports to these international markets? Samir Gandhi: As discussed before we are import intensive company. In the wake of challenges in terms of increasing uncertainties, intense competition, growing polarization of world trade, a cohesive effort by the automation industry and government is required to exploit emerging opportunities in world trade. Any areas where the authorities need to help the automation industry? Samir Gandhi: The general economic direction in India is towards liberalization and globalization. But the process is slow. Government should liberalize all sectors of economy with current SOPs for SEZ. That's encouraging and it must be right as manufacturers are getting more and more conscious about need to automatize. I guess thi s trend should increase and will do well if it concentrates on the domestic market instead of exports. We would like to get in touch with Mr. Gandhi, if it were possible. Thanks S.L.Goyal Prop USP Enterprises D-7/7185 Vasant Kunj New Delhi-110070 Phones: 26897019, 26122680, 9312059584 E-mail: usprises@airtelmail.in; uspentps@vsnl.com. Entry automation is at present a cottage industry but it is very upcoming. people want to use it but there is no fare pricing as this is not an organised sector.supplier charge very high price in the name of Italian and german product as there is no reputed supplier in india. after sales service is also horrible.In spite of all above the segment is growing rapidly and expecting a Rs.5000 crores market in next 4 to 5 yrs. as a serious player we want to provide better solution at affordable prices. I want to know which city in India has maximum automation growth so that I could go their and look for oppurtunities.. thanks in Advance.